Dr Belt performs phone or Skype consultations to minimise the number of trips to Brisbane. During the consultation, Dr Belt will assess your surgical expectations and suitability for surgery. This will also ensure that you do not have a wasted journey if you aren’t suitable for the procedure you are seeking (for example if you are still smoking for an abdominoplasty etc.). 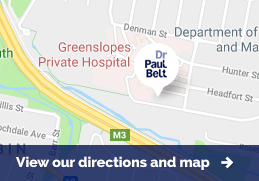 Dr Belt will explain every aspect of your procedure, and give you an indication of the duration of your hospital stay, and the time that you need to remain in Brisbane. It is preferable for you to send photos of the relevant area before your phone consultation (not necessary for Skype). Dr Belt will refer to these images when planning and discussing your procedure with you. When taking these photos, please try to get images from multiple angles (front, side and oblique views) . Please send all photos to paul@paulbelt.com.au This is Dr Belt’s personal email and these images will be stored in a secure site. Dr Belt can assure you that the images will be treated in the strictest of confidence. Dr Belt’s reception staff will be happy to guide you through this process. Subsequent to the phone or Skype consultation, Dr Belt will provide you with a quote for the procedure. He will also advise if you need a formal consultation on the day of surgery, or one to two days prior to your procedure. He will also provide you with possible surgical dates. Once you decide upon a date for your surgery, you will be advised when you will need to arrive and how long you will need to stay after your operation. If your procedure is a day surgery case, you will need to bring someone to accompany you for at least the initial part of your stay. This can be a spouse, partner, relative or good friend. If you are unable to bring someone with you, then let us know early so that we can arrange for your procedure to be performed as an inpatient, or arrange for a nurse to accompany you. Dr Belt will also arrange your follow up so that you can pre-plan your return journey home.